It’s been just over a week since we first broke news of “On Finn Ice”. At the time we didn’t have much detail, but based on the imagery and Tweets we were speculating that it was going to be a brand new Angry Birds Seasons update. Well, as usual, we were right. :) Just a few minutes ago Rovio released the first official Angry Birds Seasons On Finn Ice trailer, which you can watch above. Our super sleuthing ability has detected something interesting at about 00:12 in this trailer. A NEW BIRD! More specifically, it looks like a blue Terence that comes packed with a special bulbous bomb blast ability — BBB for short. 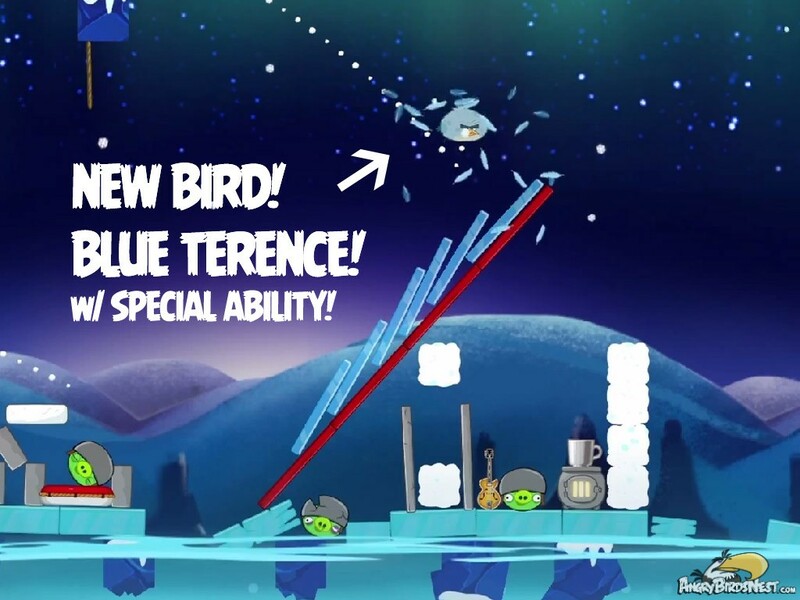 When you tap the screen Blue Terence — for lack of a better / official name — will immediately shoot straight down. Proof is in the pudding. We snapped these two images. Initiate the BBB (Bulbous Bomb Blast)! I am now extra excited for this update. How about you? In my mind only one question remains: “Will this be an advent style update?” What do you think? Will be looking forward to these levels once released!! Always entertaining & challenging!! Haha i noticed the cello next to the helmet pig in the second screen shot! A nice tie-in with the band Apocalyptica and their heavy metal cello songs. Except that it’s an electric guitar as evidenced by its six tuning pegs, fretboard with fret inlays, cutout, pickup, etc. 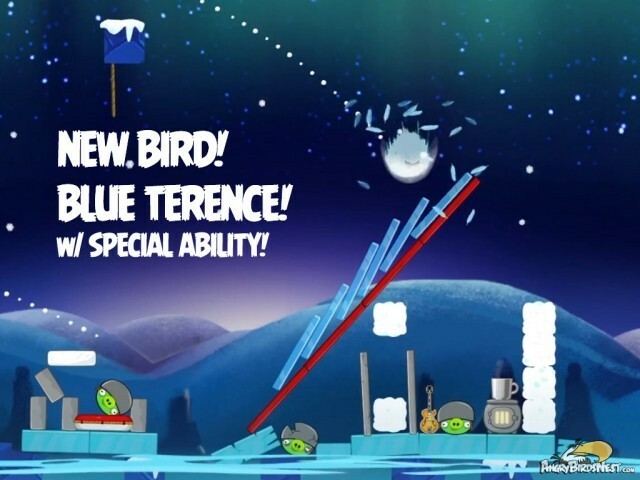 Is it a new blue bird, or just a transformed Terrance? The slingshot looked like a standard Terrance. @greenimperial To me, it doesn’t look like a whole new bird. It looks like Terence developed a new power. At least that’s what I gathered, given the Terence train arrival sequence. And unless they did some huge editing, that definitely was normal Ter in the slingshot. I guess he became blue when flung or when his icybomb power was triggered. The Terrance at the slingshot and the new power Terrance are different levels. This must be the new Christmas update. His power looks like poppy’s power from ab stella! I too think his power looks like Poppy’s from Stella. We’ll figure out soon. My two cents says it is a new bird with new powers. I think it’s a new Terence with the BBB, and looks like Rovio will release these new levels advent style. Can hardly wait! As @sntrooper mentioned, there are clips of several levels. Think I counted 5 if did not miss anything. 4th one is clearly piggies playing icehockey outside. Nice find! It seems to be more than just fan art. Thanks @sal9, that was fast! I really, really love the new song! the ne bird part….MADE ME SMILE. Looking forward to it!! I do hope its advent style and they revert to keeping one level a day – I much preferred that to last year when you could move ahead in the episode! Anyone think the new bird’s name is going to be Finn? I think it’s just a Terence who can’t handle the cold, but if it is a new bird that needs a new name, I’d vote: Snowbomb. T-cicle, or even Ice Ice Terry. I think Lawrence would be nice. Terence and Lawrence. Already checked out the official AB Twitter account. Surprisingly, “Blue Terrence” will be named Tony. Surprising? The Big Red Bird being officially named Terence is suprising. I’m a bit surprised they didn’t just stick with Ice Bird from Space, though this looks cool (pun intended)! I wonder if it’s a new bird, or simply Terrance gaining a superpower, like Red’s Mighty Feathers. Not a bus, not even a trolley but a tram, which is probably a good thing considering that Terence is somewhat heavy. on the description on youtube it say’s that is terence’s Finnish Uncle. Hoping for a regular (v.advent) episode and love these more original style updates/games. Wish they’d unveil even more during the year. Terrance is pretty much my fave so can’t wait to see how his uncle gets on in the flock, looks like he has a good trick under his feathers. Okay, so we’re getting a new bird, yes? But why won’t they bother updating the graphics of the birds and pigs to their current graphics? Looks cool. Looking forward to it! at a fair price? Thsnks a lot, I appreciate it!